You can purchase both a mildewcide additive (M-1 brand) and our clear UV protectant to add to any of our finishes for extra protection in the weather. Our "Exterior Finish" already has both the mildewcide and UVA added to it. These items are pre-packaged and sold separately and can be added directly into any of our finishes, pre-measured to treat a one gallon pail and a 5 gallon pail. 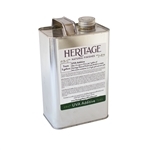 This is our broad spectrum clear UV protectant which you can add to any of our Heritage Natural Finishes products. Enough to treat 1 gallon at our recommended rate. Shake or mix well into our oil finishes and apply as normal. 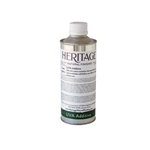 Add to any Heritage Natural Finishes products for extra mildew protection. This is our broad spectrum clear UV protectant in a base of Pure Citrus Solvent which you can add to any of our Heritage Natural Finishes products. Enough to treat 5 gallons at our recommended rate. Shake or mix well into our oil finishes and apply as normal.